I don't know about you, but I have always associated lemon with summer. Fresh, vibrant, and sharp, it seemed to embody all that you crave when it's numbingly warm and sticky, as it usually is in summer in Tokyo. But as many of you know, lemon is actually a fruit of winter, just as almost all citrus fruits are - although it doesn't thrive in cold climates. And now I think about it, the sun-kissed lemon coming from somewhere warm when you are coping with bitter coldness may be a blessing, something that helps you go through the last few months of winter and look for spring. At the end of January this year, I ordered a 5-kilo (11-lb) case of organic lemons, fresh and ripe, shipped straight from a tiny island on the inland sea in Hiroshima where they are grown. 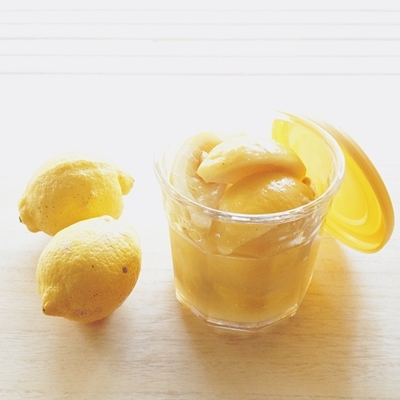 In the past, lemons you buy in Japan were almost always imported. More and more domestically-produced lemons, mostly from the southwest part of the country where the climate is mild, have become readily available over the last decade or so. Nowadays you can buy them at many supermarkets even in the countryside, including ones in my neighborhood. The reason why I wanted a lot of lemons was to make our own limoncello. During my last visit in Italy last spring, my friend Sigrid had me very well looked after, and saw me off with loads of Italian goodies for me to take with. One of them was her Italian mother-in-law's homemade limoncello. I brought it back home and shared with my folks, and we were all blown away - it was strong but smooth, sweet but not cloying, and bursting with lemon flavor. My mother in particular loved it so much we begged Sigrid to ask her mother-in-law to share her recipe with us. She has very kindly done so - in a form of hand-written (!) 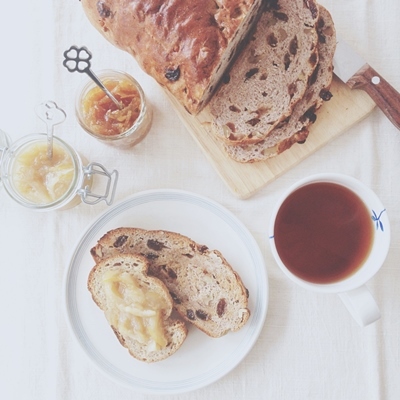 recipe, which Sigrid translated into English for us. As far as home-made liqueurs go, the most common kind we use here in Japan is what we call "white liquor", a 35% alcohol neutral grain spirit. As the recipe we received did not specify the type of alcohol to use (it was simply mentioned as "alcohol"), I did a bit of research myself, and found that limoncello is typically made with spirits with much higher content of alcohol. The limoncello Sigrid gave to us was also very strong. So for our limoncello I got myself a few bottles of spirytus, a 96%(!!) alcohol rectified spirit, as well as our staple 35% stuff. Our plan was to make two batches using the two different kinds of spirit, and see how they each turn out. We also prepared a batch with yuzu in place of lemon and spirytus. 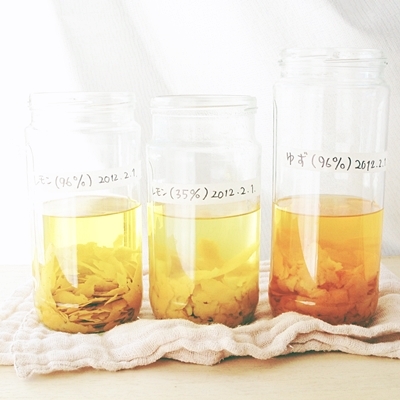 The recipe itself was simple enough; let wafer-thin strips of lemon zest steep in alcohol for a week, filter, combine with syrup and leave it to sit for some months. It called for quite a lot of lemons (hence my 5-kilo case) - more precisely, zest of a lot of lemons. At the end of the first step (combining zest with spirit) we were left with 20 lemons (and six or so yuzu), sans zest but otherwise whole. I turned some into a lemon chiffon cake and lemon curd, sliced up a few into thin wheels and steeped in honey, and squeezed a whole lot and froze the juice for later use. Let me tell you, THAT was a lot of lemons to use up! 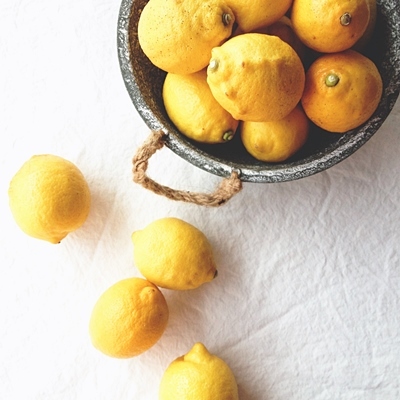 Growing up I made a countless jars of honeyed (or sugared) lemon slices, but never with lemons with zest removed. Since that's where much of the lemon flavor comes from, I didn't really expected this batch to be all that flavorful - which I was pleased to find to be wrong; the slices were still very lemony and in fact quite mild, so much so I ended up finishing the jar by simply snacking on a few slices as is every day. I've been in a sort of chiffon cake-baking frenzy for the past few months, and lemon chiffon cake was naturally a thing to make. 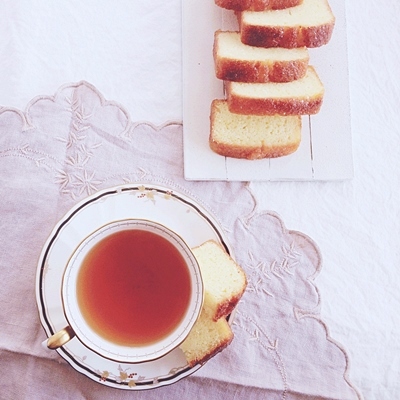 My go-to chiffon cake recipe these days is one for yuzu chiffon cake found in this book (in Japanese) by Shiho Nakashima, a Japanese baking book author and cake shop owner. It is a mighty tall and dangerously soft cake with a lot of zest and juice of yuzu (here I use lemon instead) in it, along with a touch of honey and a moderate amount of poppy seed. I've baked this one about 5-6 times in these past couple of months, half of them as a gift for family friends; everyone seems to love them, and so do I. It tastes terrific as is, but is also nice with a dollop of lemon curd alongside. Now, about lemon curd. I love it, always have - but have stayed away from the stuff for a long time. I thought it was rather fussy to make with all that heating and stirring required and a risk of curdling. 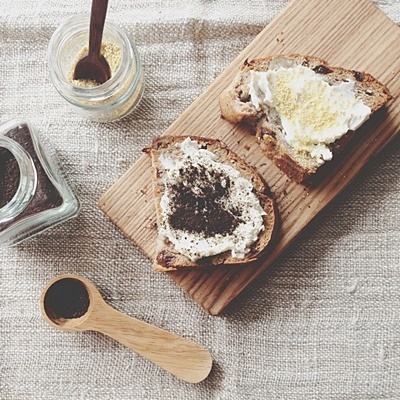 And even if I got a store-bought jar, I could never finish it before it went bad (their shelf-life is reasonably long while unopened, but once it is opened, you are supposed to use it up within a few days), as I tend to enjoy it only in a small amount at a time. So I was really pleased to find this recipe. It has you cream the butter and sugar first, before adding the eggs and lemon juice and heating the mixture. All that heating and stirring is still required, yes, but this way you don't have to worry about it getting curdled after all these efforts, which suits me perfectly. It also says you can keep it in the freezer for a couple of months, which was a sort of revelation to me; no need to worry about using up a whole lot of it in a hurry! So far I've made three batches (in half the recipe) in the past month or two, and it has proved to be indeed handy a thing to have around. 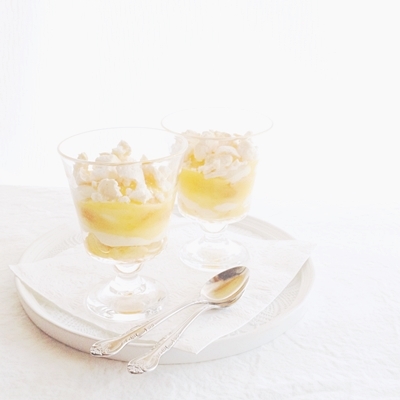 For instance, to make this lemon meringue ice cream from How to Eat by Nigella Lawson (Chatto & Windus, 1999). More like frozen yogurt than ice cream, it's basically Greek-style yogurt, lemon curd, whipped cream, and crashed meringues mixed together and frozen. Whatever you call it, it's easy to make if you have lemon curd in hand, and an absolute pleasure to eat, particularly in a warm room on a cold day. 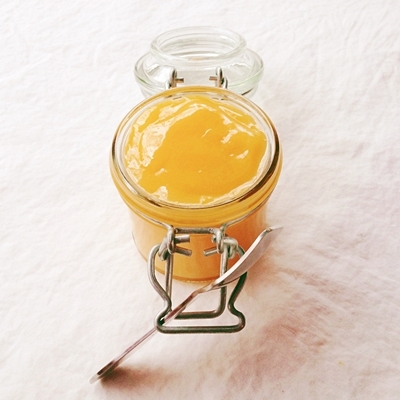 Lemon curd makes a fabulous accompaniment to cakes, scones, cookies, you name it. You can fill your cakes and tarts with it to great effect, too. 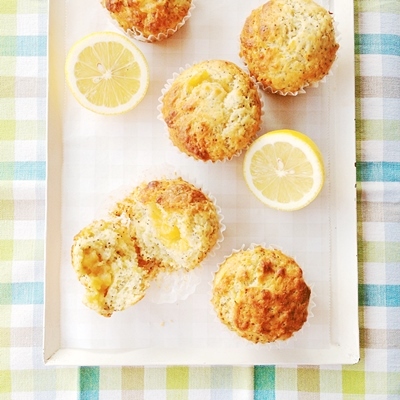 And as it turned out, it also does a good job hidden in muffins, as it did here with these lemon poppy seed muffins filled with lemon curd. The addition was suggested as a variation to the lemon poppy seed muffin recipe in Baking: From My Home to Yours by Dorie Greenspan (Houghton Mifflin Harcourt, 2006), and here frozen lemon curd worked really well. The recipe by itself makes superb muffins, by the way; you can find a very similar recipe here (add some poppy seed and skip the lemon extract) but I don't think you'd be sorry to have yourself a copy if you do not already have one - it's seriously an excellent collection of great baking recipes. 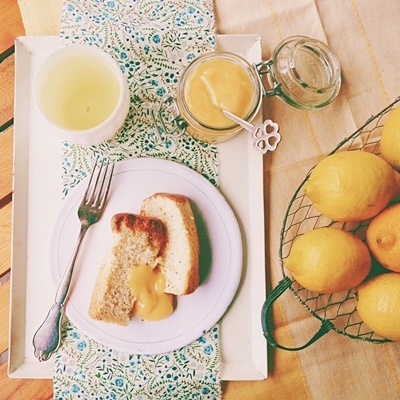 And did I tell you lemon curd makes a cracking accompaniment to cakes, too? 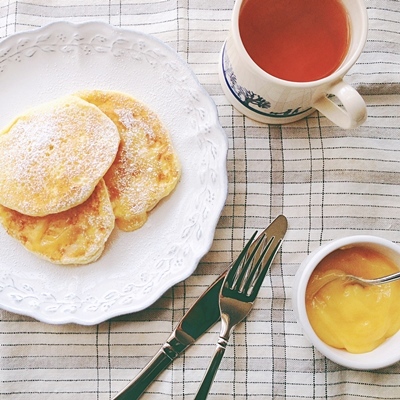 Here cakes being pancakes, and not just any pancakes but fluffy ricotta pancakes. Warm, fluffy pancakes were flattered really well by the sharp and sweet lemon curd that melted slightly on the warm cake - my idea of perfect breakfast. While I love eating pancakes, frying them is not my strength, however; but using egg whites beaten until stiff seems to make it less likely to flop, and sure makes extra-fluffy pancakes - so does the addition of ricotta. The recipe I used here is this one. Oh and by the way, I made ricotta myself, too. In Japan, ricotta cheese is one of these items that are always imported and outrageously expensive for the quality that is mediocre at best. These days I've been doing myself a favor and making homemade ricotta cheese, and it is great. I know this is NOT the same as the real stuff, but it does the job perfectly well for home cooking and baking. I've tried a bunch of different recipes, but here used the one mentioned in the pancake recipe above, using, why, juice of a lemon. Now, as I worked my way through the 20 lemons after preparing limoncello, I had a leftover pith piling up in front of me and wondered if I couldn't put it to some use. 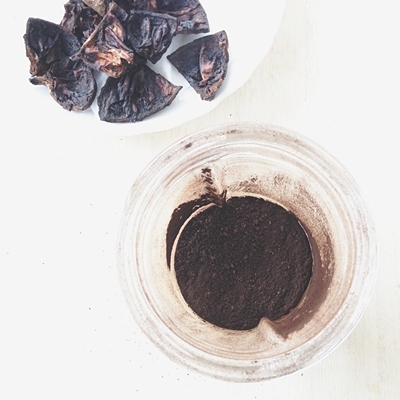 Then my good old blogger buddy S mentioned to me this idea of roasting it until it becomes charcoal and grind it into powder, to be used as topping or a flavor add-in. I had never heard of it but now that I did, I just had to give it a try. I did a quick search around and found this post. They roasted their spent lemons in an oven, but since we use our little space heater to prepare all sort of food (boiling water for tea, toasting bread, grilling vegetables, cooking stews, etc.) during cold months, so that was what we used instead. We let a bunch of lemon pith left after zesting and juicing sit on the top panel of the heater until they were completely dry and turned mostly charcoal, then left them to cool down before processing in the pepper mill. The result was this lemon charcoal powder, dark-colored particles with a distinctive smokey note and a whiff of lemon; it was interesting to smell even a hint of lemon in it, considering all the 'flavorful' parts had been striped off and the whole thing was, well, charcoal. While we were at it, we also made another kind of lemon powder, using another kind of 'leftover' lemon - that is, some of the strips of lemon zest that had been used to infuse the spirits to make limoncello. When we took them out from the spirit, they were really dry; of course they were wet on the surface as they had been in the liquid, but the strips themselves were bone-dry, having rendered much of its oil and moisture into the spirit, I assume. They did have a wisp of lemon scent still left in them, so we let them dry and ground to powder as well. I've made these only in a small amount and have few ideas how to use them, but I found them an interesting way to salvage at least part of what would otherwise have gone to waste. So far I've only tried them on a piece of toast along with a smear of cream cheese, and they weren't half bad. 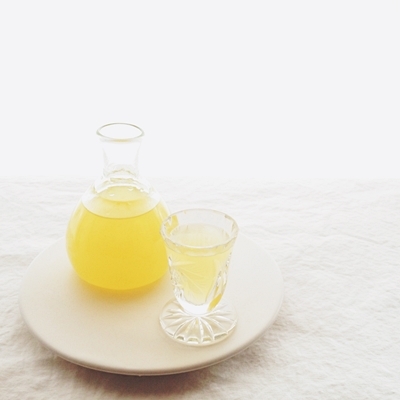 And so, a week had past since we prepared our limoncello. While filtering the mixture, I cooked up a large pot of syrup, and combined it with the filtered citrus-infused liquors. This is where a change happened; those prepared with 96% alcohol spirit become sort of turbid, while the lemon liqueur with 35% alcohol spirit was quite clear. I wouldn't go into the science behind this difference, but it was an interesting thing. Now the liqueurs could be served at this point, but Sigrid said her mother-in-law usually leaves hers to sit for months before it is deemed ready to drink, so that's what we intended to do too. But we did take a small sip from each of the three jars, and were thrilled to find both of the two batches of limoncello were already quite tasty, especially the one with 96% alcohol spirit. They tasted still harsh, which 'un-matured' homemade liqueurs often do. 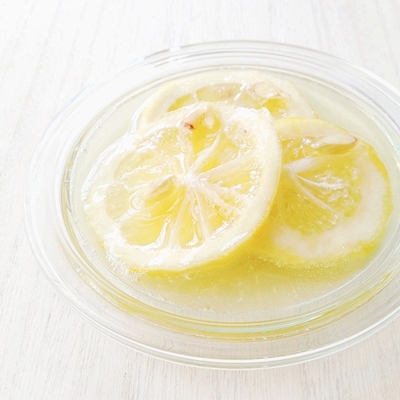 As for the 'yuzucello', we must admit that it tasted a little too bitter and altogether too potent; yuzu naturally has a bitter and stronger flavor than lemon, so we should probably have gone easier with it. We'll leave it to sit for some months alongside the lemon liqueurs and see how it develops. Meanwhile, I had a few other things going as we bottled our citrus liqueurs. I boiled a few whole lemons to make marmalade, processed another two to make sorbet, and quartered a yet few others to salt-cure them. I don't think preserved lemons are a common cooking ingredient in Japan. I for one am not very familiar with them, but have certainly been curious, and here finally got myself round to trying my hand at it. I've found quite a few recipes for them both on the Internet and some of the cookbooks I have, and I settled on this recipe as it seemed to be very simple; just lemons and salt (and some extra juice of lemon). ...Now, can we talk about sweet things again? Served in lemon shells here were lemon sorbet. A pure bliss of whole lemons blended with sugar and an extra dose of juice of lemon, this to me is a taste of Sicily in a frozen form, which has everything to do with my visit last year to Case Vecchie, a beautiful and historical estate in the heart of Sicily where Fabrizia Lanza teaches traditional Sicilian cookery with her signature grace and passion, following her mother, legendary late Anna Tasca Lanza who started the school. The recipe for the sorbet is from Fabrizia's latest book Coming Home to Sicily: Seasonal Harvests and Cooking from Case Vecchie (Sterling Epicure, 2012), a beautifully photographed, engaging read with a collection of Sicilian recipes Fabrizia makes using ingredients from her kitchen garden and beyond on the island. Another thing I did with whole lemons was lemon marmalade. Mostly following this recipe, I boiled a few lemons whole, then chopped them up and cooked with sugar and honey. The result was quite bitter - a little too much so, even to us who usually enjoy bitter marmalades. I later made another batch of lemon marmalade (the paler-looking one of the two pictured above), this time using my own yuzu marmalade recipe, with lemons instead of yuzu. I boiled the peel and pith a few times, each time using fresh pot of water - but the marmalade was still pretty bitter. There's much room for improvement, but still both went down well slathered on fruit-packed bread or swirled into a bowl of yogurt. Love having a jar or two of marmalade in the fridge. 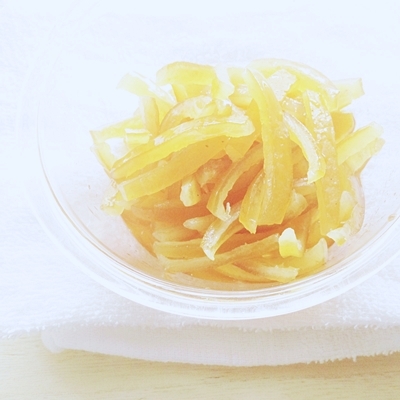 This one did not use whole lemons, but keeps just as well as marmalade does: candied lemon peel. I have a small jar packed full of this kept in the fridge, to use in baking later. Recipe was also from Coming Home to Sicily. I also made candied lemon slices, which served their role in baking straight away in this candied lemon tart. Once you have your candied lemon slices ready, it was a breeze to put this together, and this was a stunner - well, even with the edges burned here and there (or, as someone on instagram very kindly said to me, 'over-caramelized'). You can find the recipe here. 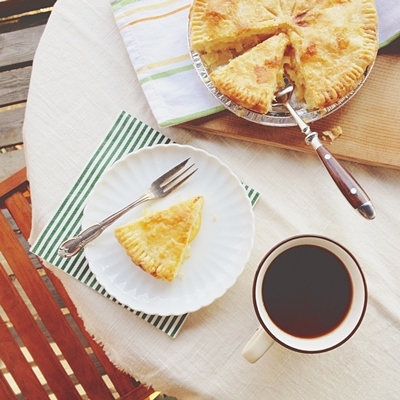 I hardly ever bake pies, let alone a double-crust kind. In fact, I can't tell if I have ever even made one. But this turned out perfectly fine - perhaps I ought to make them more often. Maybe. To tell you the truth, I was a little disturbed by the amount of sugar required, but closed my eyes (not literally...) and got on with it. I was also slightly skeptical about this one before I had my first slice. I mean, the filling is literally just a mixture of lemon, sugar, and eggs; wouldn't that make a sort of sweet, lemon-flavored scrambled eggs? But my doubt proved to be wrong to my delight, and the pie was delicious. 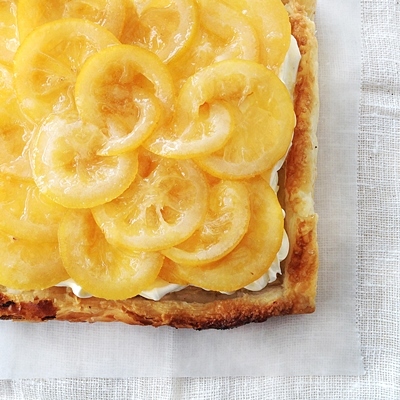 Rustic, buttery, lemony, and sweet. What's not to love? 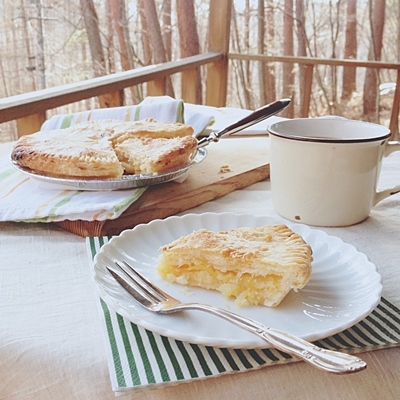 This pie reminded me of another lemony treat that I've loved for a long time. These lemon squares are one of the things I've made the most from this book (in Japanese), which was published in 1992(!) and introduced me to American and European baking when I was a teenager. It had been a while since I made them last and I managed to make some gaffes here, but still absolutely tasty. 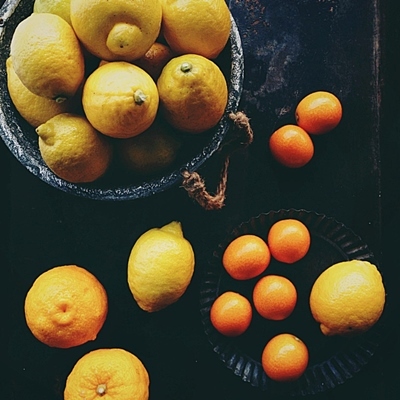 And when you are baking this much with lemons, five kilos can somehow disappear rather sooner than you'd expected. Now what? Why, get another case of them! When I opened my first case to see 30-40 lemons in it, I wondered if I would be able to finish them. But after weeks of using them to my heart's content, it was a kind of sad to see them down to the last few, you know what I mean? 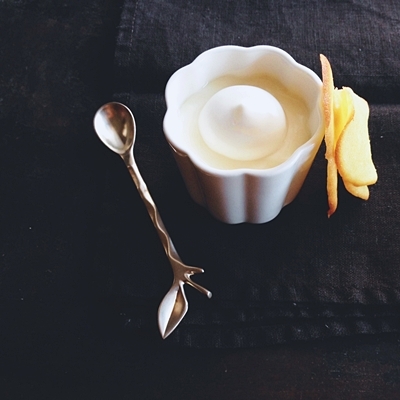 We don't gorge ourselves on chilled desserts too much during cold months, but I did make a few, such as this lemon cream pot with lemon wafers. It is what they call lemon posset in England - heavy cream and sugar cooked over low heat, then added with zest and juice of lemon, and chilled. This is a really rich, heavy dessert that should be enjoyed in a small cup. Old-fashioned but sophisticated enough. 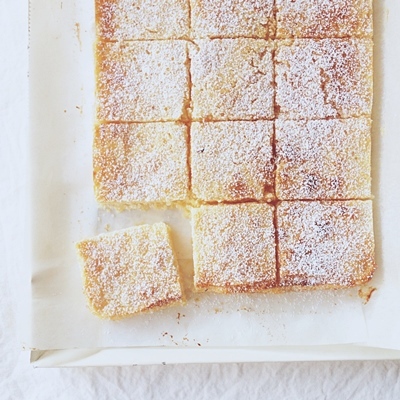 I used this recipe - I could have made lemon wafers better, I think, but that was that. Another chilled dessert: lemon trifle. I didn't follow any particular recipe for this one but just whipped it up by making layers of mascarpone cream (mascarpone cheese and heavy cream, with a touch of honey), lemon curd (homemade! ), and ladyfingers dunked in limoncello syrup (homemade limoncello tamed with some water and a bit of honey). Topped with some crashed meringues, it made a rather fabulous dessert if I may say so myself. Our homemade limoncello, although still two-month old and not quite ready to drink yet, did a great job flavoring the pudding. 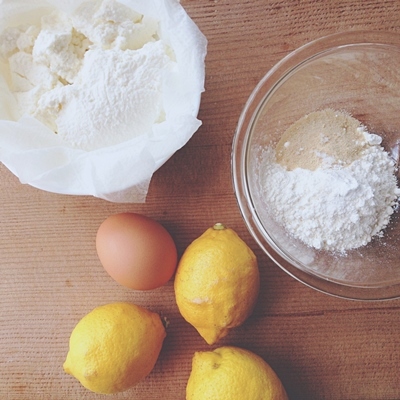 Lemon scones. 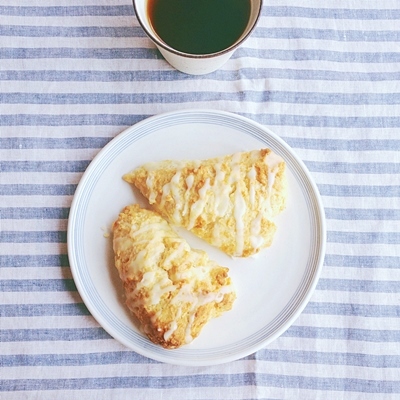 Do they still sell lemon scones at Starbucks? Not in Japan, apparently - at least I haven't seen them in a while, and kinda miss them. So here I opted for something along the same line, and tried this recipe for the most part. 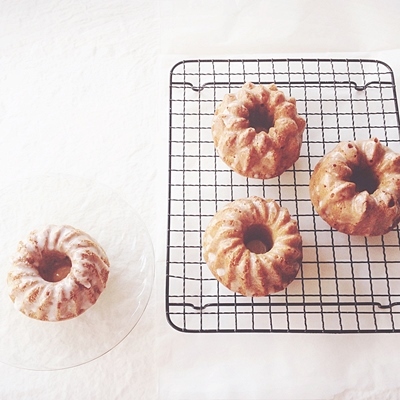 I replaced half the heavy cream with buttermilk, but they were still quite rich and cake-y, and hands-down delicious. I added a bit of lemon zest to the lemon icing, which added a touch of lemony yellow to it (though you can't really tell from this picture). Cake weekend au citron, or 'weekend lemon cake'. 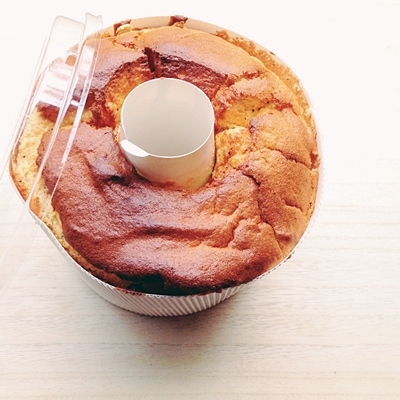 I don't know about other places, but this is a fairly common item to find at French-style pastry shops in Japan. In essence a very lemony pound cake, it's usually coated with a generous dose of lemony icing. Here I used a recipe in this baking book (in Japanese), not to a great success exactly (somehow the icing didn't turn out right) but the cake was still tasty on the whole. Perhaps a project for another weekend in the near future. On the other hand, icing was truly the star of the show with these little bundt cakes; lemon cakes with gin frosting, or what I call gin and lemon cakes. Yes, GIN FROSTING! Among various spirits I like gin the best for drinking (in cocktails mostly), but had never used it baking; I've perhaps used it to make sorbet or granita once, but that's about it. 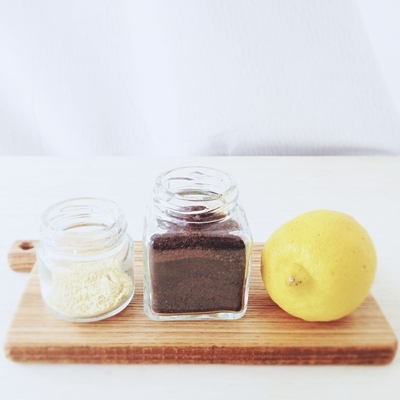 Then a few weeks ago I saw Y (of the blog lemonpi) make a lemon cake with gin frosting on Instagram. The cake looked stunning, but it was the idea of gin frosting that blew me away - why has it never occurred in my life before?? I wondered, and set out to remedy that, and here was the result. I used a random lemon cake recipe from one of my baking books, and made the icing by combining some confectioners' sugar with a dash of juice of lemon and gin. The cake was not the best I've ever had, but the icing really saved the day with a whiff of gin, very subtle but definitely there. I will have to have it again with a decent lemon cake that's worthy of this special frosting. 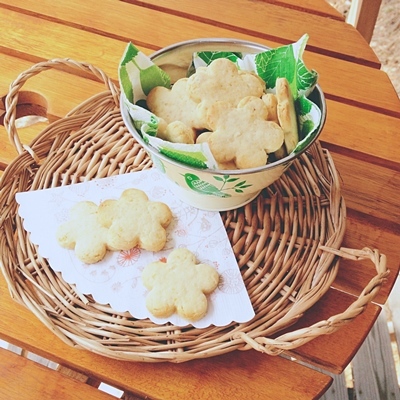 These lemon cookies I didn't ice, but it would have been lovely - although they were nice uniced, too. The recipe (in Japanese) was by Shiho Nakashima, first appeared on twitter as one of the twelve 140-character recipe challenge they did here. They were made using vegetable oil rather than butter, which allows you to make them in a jiffy. 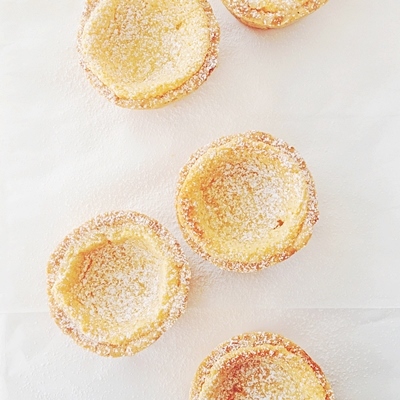 Lemon tartlets, or Tartest Lemon Tart as cookbook author and baker extraordinaire Dorie Greenspan calls it in her masterpiece of a baking book Baking. Did I tell you that you should do yourself a favor and get the book if you haven't already? Well, you really should. These are a sweet tart shell (with nuts) filled with a super-lemony sweet and tart filling made using whole lemons, peel and pith and all (save for pits) pureed in the blender. 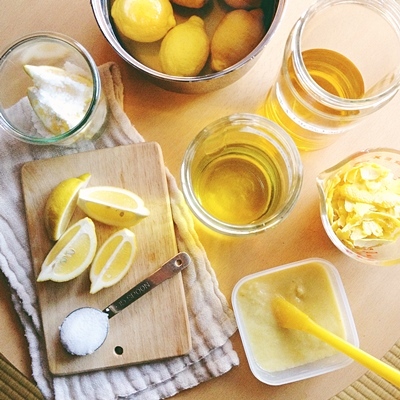 If you love flavors of lemon, the tartness and bitterness of it all, this recipe is for you. As far as lemon tart(let)s goes, my golden standard has long been Bonne Maman's. I've tried and recreate them myself a few times in the past, without a real success. Now this recipe might just be the one for me, even though the tarts aren't in fact very like Bonne Maman's if you compare them head-to-head (BM's have a jammier filling for one thing). I don't think I need to look further. Also from Baking, this recipe was named The Most Extraordinary French Lemon Tart - and extraordinary it is. 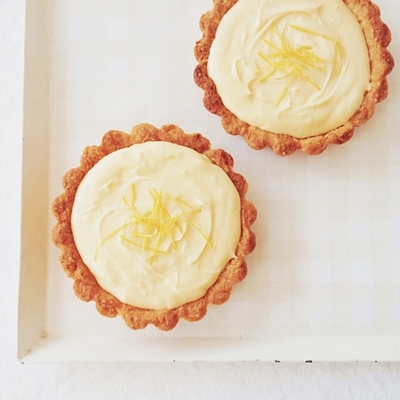 What makes this tart the most extraordinary, definitely, is the extra-light and silky filling; the lemon cream, the recipe of which Dorie says she learned from none other than Pierre Herme. In terms of ingredients, it's a lot like lemon curd. But it's how you make it that is very different, and that makes the whole difference. Here you add softened butter little by little to the cooked egg-lemon-sugar mixture. 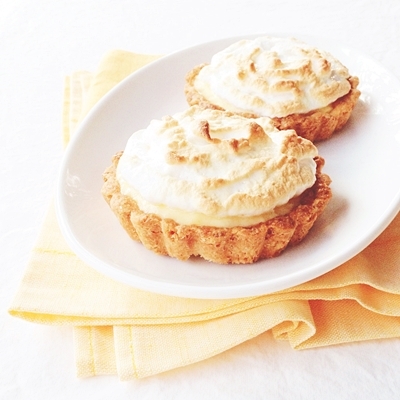 The result is a mound of airy cream with a soft lemon color and a sharp lemon flavor. I couldn't help but think that it looked a bit like mayonnaise - which inspired my little April Fool's day joke this year. But in a way it is a bit like mayonnaise, the way you make it by emulsifying the ingredients. Okay, am I practically putting you off now? Then I apologize, because this really is sensational a thing - intensely lemony and incredibly light. In fact, it is so light it's hard to believe how much butter is in it. I was positively alarmed by it when I first saw the recipe, and now that I've taken the plunge and had a go at it, I can't decide whether or not it was a good thing that I actually loved it, or that a large tartlet went down faster than I'd intended. 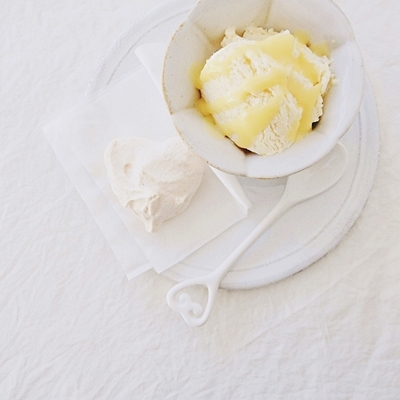 Like the lemon curd, this cream can also be kept frozen. I made half the recipe and still had some leftover, so I froze it and used it in something else later. 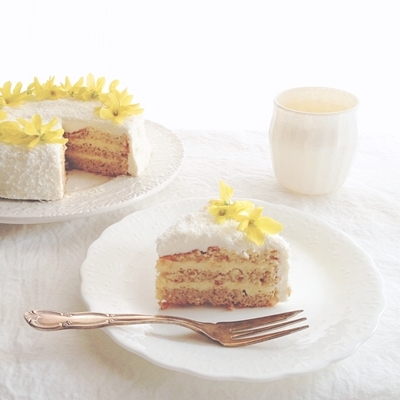 Lemon layer cake. Well, you can't see the lemon part, but there you are. This is a type of what we call 'short cake' in Japan, which is typically filled with fresh strawberries and whipped cream, like the one I made last spring. Here I filled slices of sponge with the lemon cream, which was iced with cream cheese frosting and dusted with finely shredded coconut. 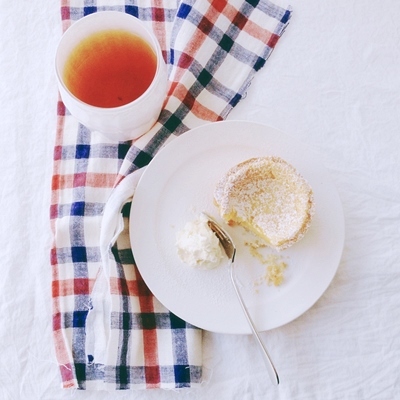 On the whole, it's a very light (in texture), springlike cake. The sponge is more or less like this one. I used a recipe from one of my Japanese baking book, and it was a bit of flop unfortunately - though I managed to secure three slices from it. You'd normally want to brush the slices with some syrup, but here I splashed them some freshly-squeezed juice of lemon, just to add the fresh lemon flavor. 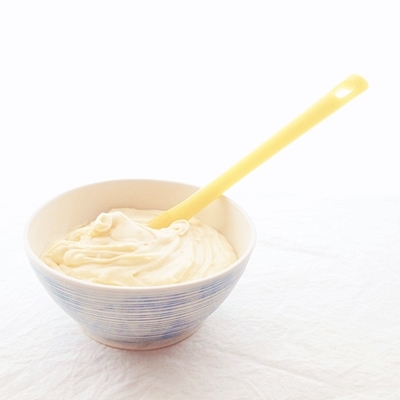 The cream cheese frosting was from this recipe, which I'd used before and liked. Traditionally, Japanese short cakes have a perfectly even, flawless layer of frosting all over, which, unfortunately, really is above me. So my solution here was to spread the frosting mostly evenly, then cover it all up with shredded coconut. Nobody needs to care how evenly or otherwise your frosting has been applied. Suits me! 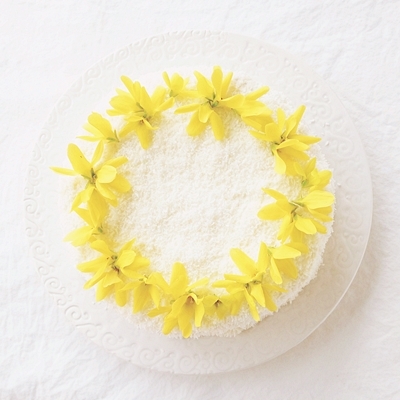 To finish, I adorned the cake with some little yellow flowers. 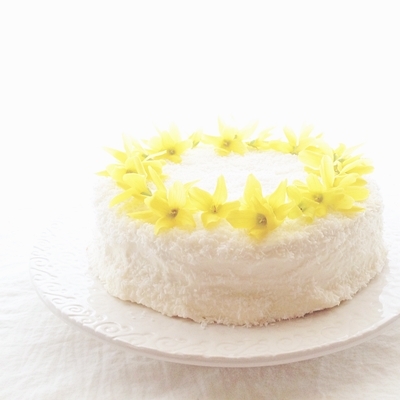 I picked them while taking a walk near my place, and I was really pleased with the way their color echoed that of lemon - and how they made the cake look so very springy, just as the winter was finally giving way to spring in our neck of the woods. Quite a lot of stuff, huh? I still have a few left, which I think I'll turn into another batch of marmalade and lemon curd. I'll also make a jar of honeyed lemon slices again, and keep it until it's warm so we can enjoy it by fixing something cold to drink. That's not until July or so, but I sure am looking forward to it. Beautiful and mouthwatering! 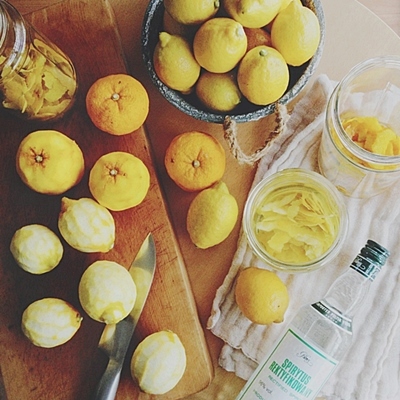 It's amazing how many things you can make with lemons. I only ever use lemons for salad dressing and savoury dishes but love the way lemons transform cakes. I too first came across limoncello when I visited Italy as a student and bought a small bottle from a monastery. It was the first time I tasted lemon liqueur and I loved it. This is seriously THE most amazing lemon post I've ever read. Next time I have lots of lemons and can't think of a thing to make, I'll drop by again for a little inspiration. Thanko you so much for this inspiring post. Really amazing. Chika, I have been silently following you on the blog and instagram for a while now and am always amazed with the amount of effort you put into these posts with meticulous recording of your experiences and recipes. They make an amazing read like a story and so useful too with the tips and slides you share! thank you for yet another wonderful post! Wow I am speechless! You are really talented. Thanks for this beautiful post! "The food here is so tasteless you could eat a meal of it and belch and it wouldn't remind you of anything." 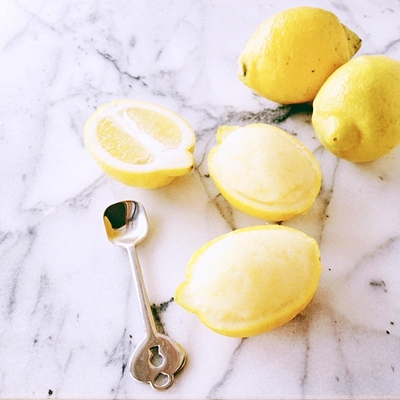 Lemons are amazing to cook with, they can be so versatile! When it comes to lemon curd I like to double boil it, to avoid it overcooking. It takes a little while longer but it is much easier to control. I haven't failed at lemon curd since I started that! I am so pumped now to try the French Lemon Tarts and making limoncello. I also get impatient when I'm making liqueur and don't let it mature long enough, so I'll have to control that impulse. A couple of weeks ago I made a lemon-limeade syrup that was delightful. Not too sweet, perfect tartness and a little pulpy. Perfect for sparkling mineral water. Thanks for updating again, when I saw the fresh post I was so excited! Beautiful work! 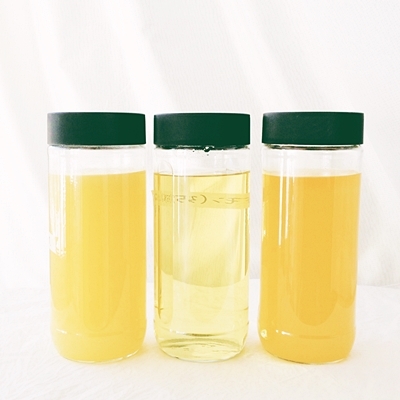 me and my mother use to make limoncello almost every year. it's just so good to sip after dinner during the summer nights! love your blog, as always! it'a always a good morning when i see your posts!